Jaysus I’d love a biscuit. I have a serious weakness for the ol’ biscuit. Doesn’t really matter what sort. 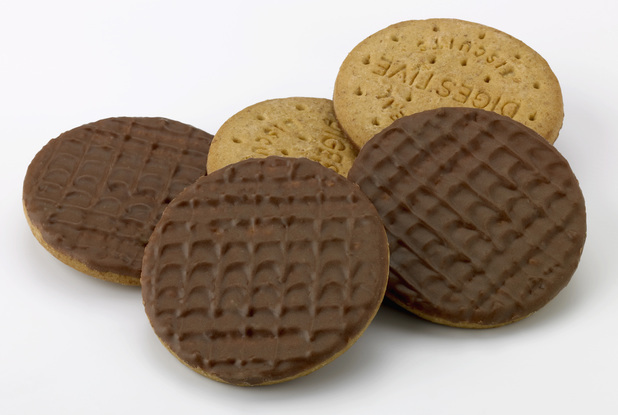 All time and all round favourite would be a McVitie’s Digestive. Versatile, tasty, simple. On their own, or with a nice slab of tangy cheddar. But then you can get dark chocolate ones too, and they’re irresistible. Biccies. Can’t live without them. When I’m at work (I work from home as a freelance graphic designer) I will find any number of cunning reasons to pop out and stick the kettle on. And with a cup of tea comes the inevitable biscuit. Over the years, the tea and biccies became something of a habit. Plus, I was throwing a spoonful of sugar in with the tea. For the criac one day, I added up the dozen or so mugs of tea a day’s worth of sugar, in a glass. That’s a lot of sugar. And that’s without biscuits. Anyways, just saying I’d love a biscuit. S often bakes some lovely peanut cookies, but they’re all gone. I’m sure there were two trays the other day, but the pixies took ’em when no-one was around. Obviously. Since last year, with the first forays into triathlons, the fitness levels have been slowly improving, and the diet has been tweaked too. The trick is to start with the shopping. It takes discipline to walk past the biscuit aisle. And I wouldn’t be the world’s best disciplinarian. Far from it. I think shopping in the morning helps. You have more willpower, and are less likely to impulsively throw all manner of sh*t into your basket. And it’s not about what you don’t buy, as much as what you do. Replace the bad stuff with the good stuff. The first step for us was the smoothie maker. And in order to make smoothies, you need lots of juice, yoghurt, berries and other goodies. So make room in your fridge for these, and you’re halfway there. I’m missing the biscuits, but I won’t miss my moobs, ha ha! We’re into Week 4 of the programme, and it promises to get harder. Yesterday I was in the gym and about 35 minutes into a bike workout which was promising to be fairly tough. The alerter went off and we were called out to a shed fire. I just had time to get dinner and we were out again for a car accident. That was the end of the workout, sadly. Swim today, if all goes well. 4 x sets of 300 metres. Woohoo!